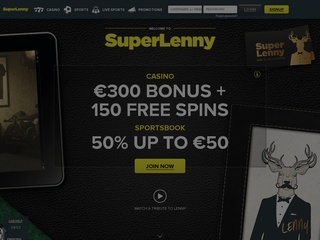 SuperLenny bookmaker dated back to its founding date in 2013. However, it was launched a year later – in March 2014. The people behind it are a group of online betting fans. The website is a bit more casino-focused, but the sportsbook is getting bigger and bigger with every passing year. The site greets its customers with the humorous “deer to bet different” as the logo. Even the website description below is written in the third person, talking about Superlenny. The bookie is owned by Betit Operations Ltd Casinos and has licenses in both UK and Malta. One of the upsides of the website is that it uses the NetEnt platform. It offers a vast array of casino games, readily available for players to enjoy. Currently, SuperLenny is top 95000 most visited websites in the world, with a tendency to rise more. Half the customer base is from Norway, followed by Swede, Finland, and the United Kingdom. Now, you can’t expect much from such a young company but SupperLenny does not disappoint. It has all the markets the bigger names in the industry have and even more. The bonus offers are quite fair and are frequently updated. Let’s see below what the site is all about. SuperLenny is a casino first and a sports bookmaker second. However, their sportsbook is growing fast. Currently, they offer 18 games to choose from – football, American football, tennis, baseball, cricket, basketball, darts, cycling, Gaelic football, fighting, handball, golf, motor racing, ice hockey, rugby union and league, snooker and volleyball. Aside from those, though, players have the opportunity to bet on various election events. Yes, SuperLenny doesn’t cover as many sports as the bookies with 25+ options, but they are getting there. Live betting is also available for the quick thinkers and analysts. The minimum allowed bet is 0.1 EUR, and there is no maximum. Players have limited winnings – 20000 EUR per bet and 100000 EUR per week. Not too bad, even for the high rollers! Even better for recreational players, because the minimum is low, and the maximum is nonexistent. The casino section is where SuperLenny shines. Customers have over 400 games to choose from, most of them being video slot machines. The most popular games are there – Starburst, Go Bananas, Twin Spin, Big Bad Wolf, Pearls of India and Jurassic Park. The only problem with the casino is that the NetEnt games base themselves on the Flash technology. While it lets people play without having to download anything, Flash is currently in a dangerous place among users and developers alike. Apple does not use Flash and playing on your iPhone or iPad might not be possible. Other than that, the winnings are great, and the bonuses are plenty. The odds on SuperLenny are about average. Not small enough to turn people away, but not high enough to beat the bigger online bookmakers. Some of the options to bet are Winner, Goals over under, Double chance, Draw no bet, 1X2 first half, both teams to score, correct score, HT/FT and goals odd or even. Other options unlock varying from match to match and sport to sport. The betting margin is lead by ice hockey with 6.4%, football with 6% and tennis with 5.8%. The overall margin is 5.8%. SuperLenny is one of the bookmakers who don’t shy away from a good connection encryption. The website has a Digicert certified SSL encryption in place, making all money transfers and personal data private and safe from attacks. Don’t worry here, Lenny has everything covered! As far as customer service goes, SuperLenny can be reached through phone, e-mail and live chat on their website. The great people who handle customer problems don’t work 24/7 – they accept requests every day from 10 am to 12 pm CET. Overall the service is great, and the answers are prompt and on-point. The website can be viewed in five languages – English, Finnish, German, Norwegian and Swedish language. Depositing money in your SuperLenny bookmaker account is very easy. You can use many deposit methods to transfer you funds. However, withdrawing is much easier than depositing, simply because the options to get your money back are so many. SuperLenny exceeds in this feature and shows other online bookies how the system should be done. Most other betting websites offer four or five ways to withdraw. SuperLenny uses a lot more. Wow, the list is long and customers are happy with it! 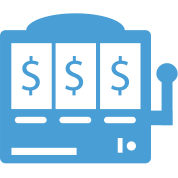 This online bookmaker accepts a variety of currencies, too. The transaction history is freely available, and you can calculate how much money you have won or lost for a particular period. 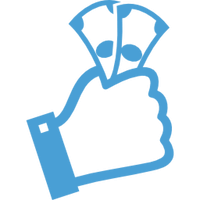 For betting in the sportsbook, new customers get a 50% match, up to 50 EUR as a welcome gift. The casino bonus is a bit larger – 150 EUR and 150 free spins on the Starburst slot machine. For the first deposit, Lenny gives a 100% increase, up to 50 EUR and 50 free spins. However, the second and third deposits get the same bonus, and it stacks nicely on top of whatever sum you already deposited. The great thing here is that the free spins do not have any requirements. Just spin away, enjoy Starburst and withdraw your winnings at any time. There are no loyalty programs available on SuperLenny, but the bookie might include one in the future. The website is still new, and it keeps adding features over time.